Mitt Romney's trip to the UK has gone from bad to worse. It was revealed today that he described Britain as 'just a small island' that 'doesn't make things that people in the rest of the world want to buy'. Mitt Romney’s trip to the UK has gone from bad to worse as it was revealed today that he described Britain as ‘just a small island’ that ‘doesn’t make things that people in the rest of the world want to buy’. The revelation makes a mockery of the racially motivated comments of a Romney advisor who claimed earlier this week that President Obama did not ‘fully appreciate’ the special relationship because he isn’t of ‘Anglo Saxon heritage’. 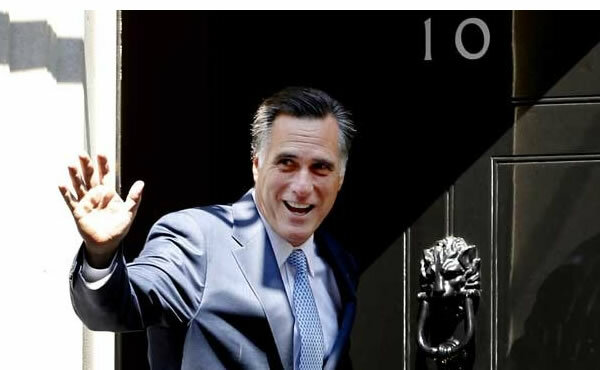 Romney’s trip to the UK has been blighted by a series of gaffes. A Parliamentary motions last week criticissed the role of Barclays executives in organising a $75,000 per head fundraising dinner, concerns were raised about the racial overtones of comments about Obama’s attitude towards the UK, and the presidential candidate today flip-flopped over the Olympics after previously questioning London’s preparedness. Is this series of gaffes the reason why tickets for tonights drinks reception have been slashed to just $1,000 per person? Same feelings here. The average of kindness is surprising and the widespread sentitivity for things like gardening and landscaping is amazing. London is such a vibrant city too, one feels that there is everything for everyone there. Hope to be back soon. They had no good option, if you followed the primaries. But you did not miss anything interesting if you missed it, by the way. @Meagan_M_Hanson http://t.co/VK5RTklO but it can be found elsewhere. Carl Lewis is so right – some Americans should not go abroad. The comments of British Empire shows Romney’s ignorance of history. Just now we have another ’empire’ – the USA in decline, this time due to military strikes outside it’s borders (creating so many enemies) and it’s lack of understanding how the world works. I find him very funny really unlike Bush, then again Romney is not in power yet. But if he thinks we build things nobody wants he needs to come here, hang on he is… we do not build much even when people want them. #Romney must like the taste of his feet: http://t.co/pcMdQXcF I'm starting to think he's campaigning for 2016. Again, no different to the Tories then, and your courts are slapping down attempts to disenfranchise people, whereas ours won’t do anything about it. And Labour are actively repelling the left with their policies, so there’s not even a meaningful alternative here. A blind man, or a Foreign politician, can see the Tory push to end the Union. A five year old can understand why austerity is bad, John. The Republicans are, in practice, far less hostile to the poor than the Tories here are proving. Get back where you came from ,you idiot! !